When you’re about to start a new study it means your life is going to change drastically. You might be moving out and live on a campus! How cool is that?! It might also scare you a little… It did scare me SO much! But since I’m going to my fourth year I’ve been looking back at the mistakes I made when I started college. And I want to prevent you from those mistakes! These tips will get you a lot further! This is the most important tip I can give you. Please be who you are. Don’t pretend to be someone else. Don’t let yourself get pushed in the corner of ‘people-think-I am-like-this-so-I-am-going-to-pretend-I-am-what-they-expect-me-to-be’. Break free from that! You’re preparing for the 'adult life'. Experiment with your clothes, wear what you want to wear. Do what you like, go out and find out who you want to be! I was too scared to be myself for almost the past three years because in secondary school not everybody liked me for who I was. So I turned into a grey mouse. A wall flower, I lost my smile. And here everybody was so themselves and I wasn’t. I’ve worked really hard for almost three years to find myself. To become comfortable with myself. Find my own style, find my own friends. I cried the first time I told my teacher how scared I was, how I didn’t believe in myself because some people had told me it repeatedly in secondary school that I wasn’t good enough. And she helped me. I went to classes to become more confident in my own competence. I was so afraid to tell my friends about this, so I only told my closest 3 friends about it and they helped me through it! So if you feel the same like I felt and you have the chance to go to classes like this GO! It helps so much. I didn’t change completely in those 10 weeks when I followed the course, even though my friends told me that they saw progress. But now, after three years I can finally say that I feel comfortable with myself. I know I’m not there yet. But I finally can say that I feel better and can tell people what happened in the past without feeling ashamed about it. (There is no need to feel ashamed about it but still you do. I don’t know why that is…It's not you, it's the people who hurt you that should be ashamed.) But those classes helped me and I strongly recommend you to do the same. Be yourself or become yourself as soon as possible. You’ll enjoy so much more of the student life as yourself than as someone else you don’t want to be! Edit: I was so positive at the beginning of this schoolyear, but a few months later I fell into a depression which you can read about here. I don’t know everything of all the schools everywhere in the world. But I’ve figured out that my school gives me a mega list of books with sky high prices. And at the end of the year I’ve used 3 books of a list where 15 titles were mentioned. So to save you some money: only buy the books when you’re teacher says you really need it. (Don’t follow this tip if you’re not allowed in your class without books. Then be prepared and buy the books that are on the list. I don’t want to cause you a horror first day of not being allowed in your class because you don’t have the books that you should have.) But if you have heard of stories like this. Buy the books a little later. Most services deliver books within 3 work days. So you won’t fall far behind IF you had to read some chapters to prepare for class. Please, talk to people. No matter how scared you are. I was shitting myself the first day at college. I was so nervous and barely talked. I watched how people made friends. Luckily my class had three really nice girls that I did become friends with but still… Talk, make contacts, smile, and introduce yourself. Don’t sit and look at the others. You need these people if you want your student’s life to succeed. They will help you with homework or group projects, make you laugh and you’ll survive boring classes together! You need friends, everybody does! I’m the kind of person that said no to EVERYTHING the past two or three years. I was scared that I would end up alone somewhere at a place where I didn’t know anyone. Now I’ve learned that it’s not okay to say no to everything. Of course, if you really don’t want to go somewhere say NO. But if you’re saying no because you’re scared, people will not really understand. In the end they won’t invite you anymore because you always say no to where ever they invite you for. Just say yes one time or two times. It’s scary, I know but don’t get isolated from the outside world. It’s so beautiful with so many lovely people. You just need to get over your fear. Tip: Ask a friend to come with you, tell him or her you’re scared to stand alone. If she is really your friend she will keep an eye on you and make sure you are not alone and probably introduces you to other people! I was looking for a job but not hard enough. So I was kind of lazy... And I thought, I stay at home all the time, why do I need money? Well, these thoughts are stupid, you need to go outside your student room. And most of the time that cost money. Sometimes I was invited and then I couldn’t say yes because I had no money. If you have a job you can also save for awesome trips, your driver’s license but you can also have some fun with friends. Going to cinema’s in my case or have a drink in bar somewhere. Money is not the key to happiness but it can make it possible for you to make memories with your friends! I feel like I was too stressed when I started college. I was freaking out about a lot of things. But you must know that you’re not going to secondary school with people who need to stand out -read bully- to become the cool kid at school. Those things don’t happen in college anymore. People are here because they want to study for their future. You’re all with the same goal at school: to graduate and get a job. I feel like I’ve given you the most important tips I could ever give you. I struggled a lot and hope this will make it easier for you to start. Make this the best time of your life in your own way. I didn't party myself to death. That's not who I am. But I did party, I went to movies, I traveled with my friend to London and Brussels. Be who you are and don't look to much around you at others 'being better than you are'. Because you are doing perfectly fine doing things your own way. I wish you all the best for this new college year! 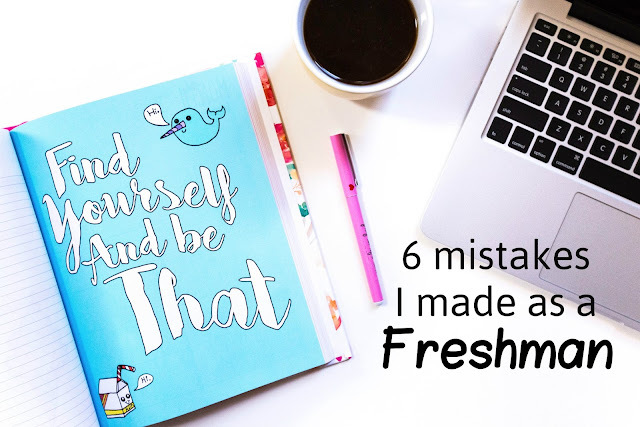 2 comments on "6 Mistakes I Made as a Freshman"
I'm so happy to hear that you are confident and happy! It's so important to find yourself and to find your own style! Also, I'll try to write more about my experience of my school and college years!